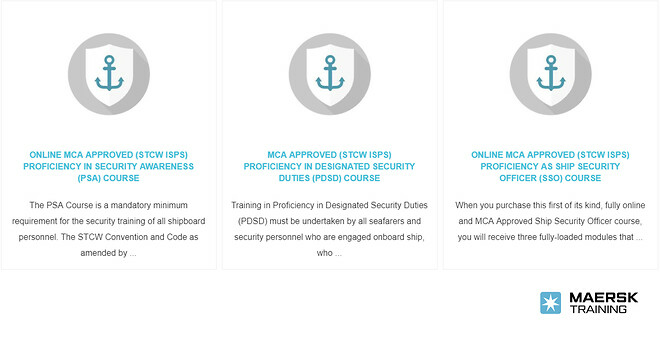 An easier and cheaper way of getting the maritime security courses. Get rid of old CDs and old methods of getting your SSO, PSA or PDSD courses and do the training when it suits you. In terms of ease and access, it is the career development equivalent of online meals, where your week’s daily diet is delivered to your door, leaving you free to devote time to other things. Online learning is where the end-product is an industry-recognised certificate that enables your career to advance without you having to dramatically break away from your routine. Freeing the need for travel, you can take the course virtually anywhere, anytime. A trio of new online courses addressing maritime issues and career enhancement are available through Maersk Training in cooperation with Manchester-based online specialists, Virtual Training Centre. Both parties have a lone and proven track record in delivering expertise. The key to this Maritime & Coastguard Agency (MCA) backed initiative is the fact that courses such as Proficiency as Ship Security Officer (SSO), Proficiency in Designated Security Duties (PDSD) and Proficiency in Security Awareness (PSA) can be taken wherever your computer has Wi-Fi access, and that the end result is certification from one of the most prominent and respected maritime organisations. Until now not all courses offer such global certification. The marketplace has numerous options through traditional classrooms and e-learning, but this collaboration is thought to be the first that frees the student from the need to attend some form of final test in a physical environment, a need that often involves job disruption, travel and a physical centre. Not to be confused with Virtual Reality, virtual learning is different from e-learning, it is more visual and interactive. It is the next stage on. The courses are often a little longer because of the inclusion of instructional or situational videos, a bonus because seeing something in action has a proven plus effect in learning over just reading. Video sticks in the mind. The Proficiency in Security Awareness (PSA) course must be undertaken by all seafarers under the Ship’s Security Plan (SSP) who do not possess Designated Security Duties or frequent a vessel often such as cruise ship staff. It’s a four-hour online course approved by the UK Department for Transport (DfT) and certified by Maritime & Coastguard Agency or MCA meeting with all required objectives stipulated by the STCW and MNTB. The Online Proficiency in Designated Security Duties (PDSD) course takes eight hours and ends with a multi-choice questionnaire. This course is designed to educate those crew members on board functioning as designated security duty personnel. The Virtual Training Online Proficiency as Ship Security Officer (SSO) course is slightly longer than many conventional computer-based courses. It takes up to 21 hours; the minimum period recommended in the Merchant Navy Training Board guidelines and is split into three modules making it easier to digest and study. This certification is required by anyone fulfilling the requirements and obligations of the Ship Security Officer. The SSO course is approved by the UK Department for Transport (DfT) and certified by Maritime & Coastguard Agency, meeting with all required objectives stipulated by the STCW and MNTB. It results in consistently high-quality training values, raising standards for safety and security across the entire industry.